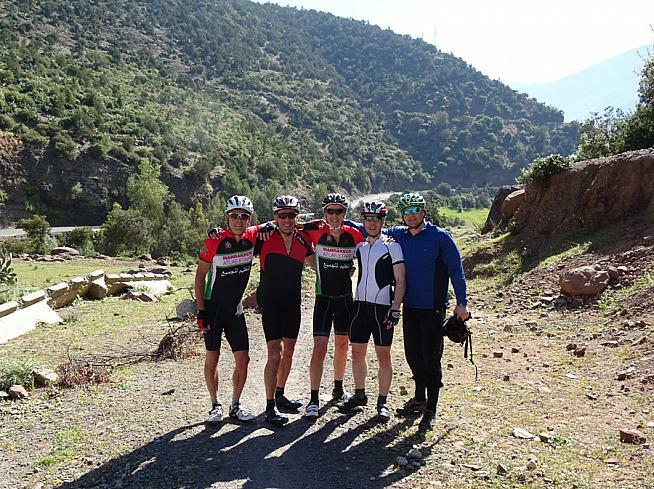 Five of us were on our annual cycling pilgrimage abroad and had entered the Marrakech Atlas Etape (MAE). However, this time we were joined by non cycling wives who had had enough of being left behind playing the role of cycling widows. 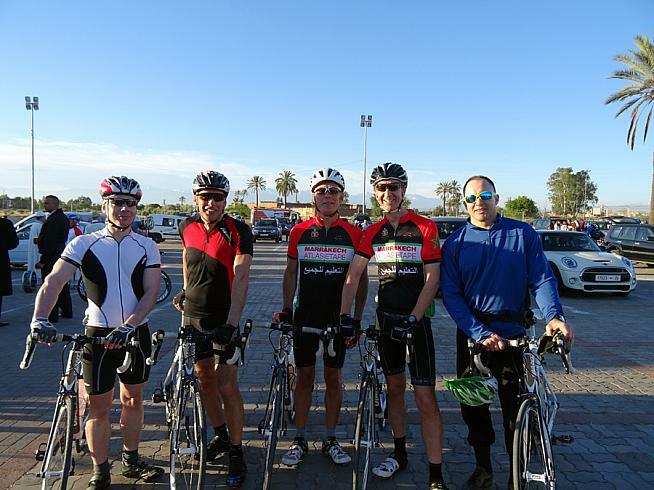 The MAE is an ideal event to keep all parties happy; cyclists have challenging rides to choose from: 140km, 104km, 84km and 60km, and non cyclists have the exotic city of Marrakech to explore. It is a perfect long weekend destination with cheap flights available from the UK. Under African skies... 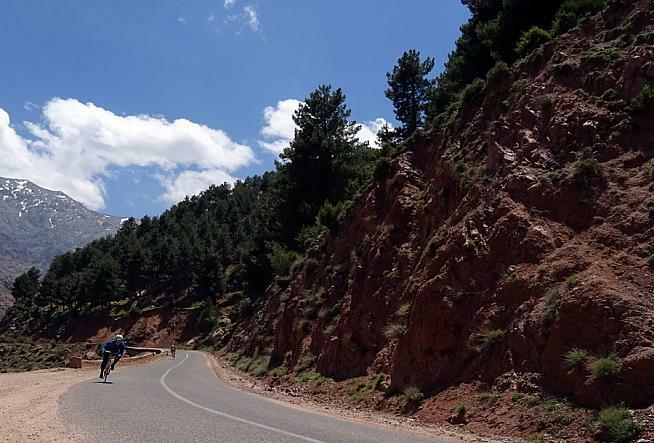 The Marrakech Atlas Etape packs in over 2000m of cimbing. The 2015 edition of the Atlas Etape is remarkably only the third year this excellent event has been running, but the brute of a climb has already grown in reputation. This year The Telegraph reported the MAE as one of the best top six cyclosportives of 2015. From what we experienced we can wholeheartedly agree. To put the challenge in perspective, with 2129 metres of elevation gain the MAE climbs twice as high as the famous Tour de France ascent of Alpe d'Huez, albeit with a lower average gradient of 5.5% compared to roughly 7% for the French beast. Ourika moment: a quick photo op at event HQ on the outskirts of Marrakech. We had signed on and set up our hire bikes the day before the event, at the Grand Prix circuit in Ourika, just outside Marrakech. Here we met up with Mike McHugo and Saif Kovach who together with Gareth Westacott are the original founders of the MAE. We apologised to Saif for missing the warm-up ride that he had organised that afternoon due to sightseeing duties with our partners. However, he fully understood that at times sacrifices have to be made to keep non cycling partners happy. 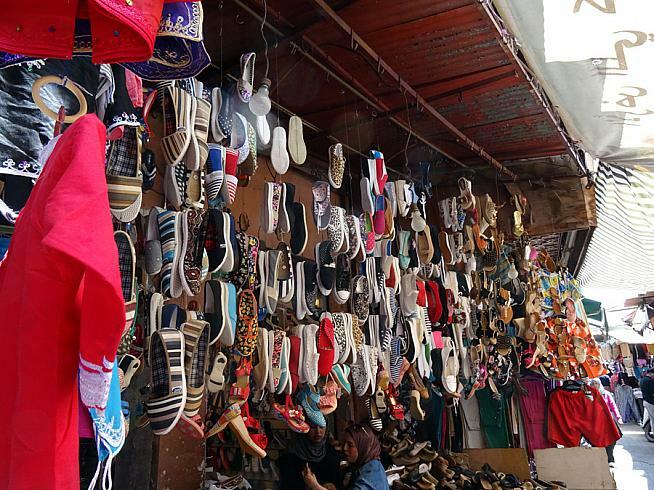 Souq it up: enjoying the colour of Marrakech's markets before the ride. Do you have anything SPD compatible? Saif and Timothy Madden set up Argan Xtreme Sports in 2010 with a vision to provide a sustainable and eco-friendly way to experience Marrakech and the Atlas Mountains. Saif, his sister and their team couldn't have been more helpful or friendly. They helped us set up our hire bikes: Giant Defy Advanced 2 carbon frames, kitted out with Shimano 105 components throughout, with compact gearsets. The bikes looked smart in white and gold and were great value at €30 each for the day. 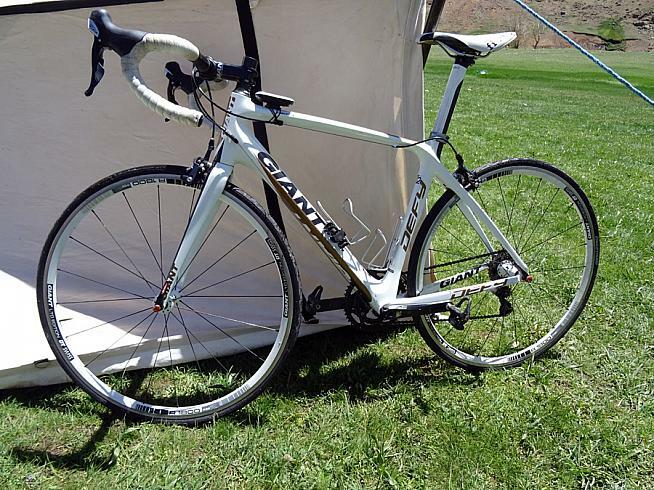 Giant Defy bikes are available for hire on the Etape. The Argan team also gave advice on how to attack the route to the ski resort of Oukaimeden. 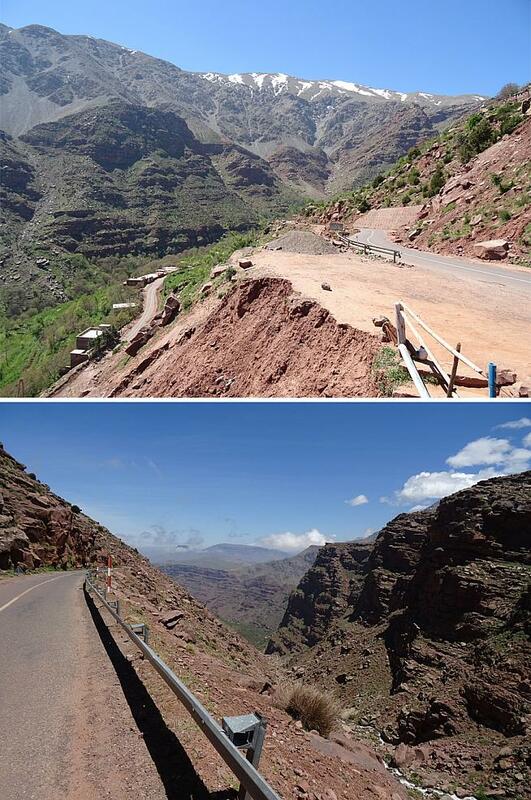 At 2624 metres above sea level, the summit of the ride makes the MAE one of the highest cycling events in the world. I left Saif to help other customers and went over to chat to Mike. Mike is also a founder member of the charity Education For All (EFA), which gives young girls in Morocco the chance of a college education. 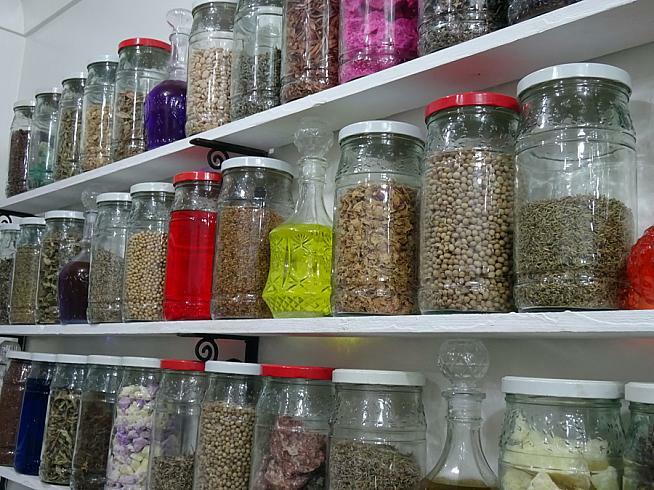 Generally, college education is not available to girls in Morocco due to their parents not affording lodgings or for the fact the accommodation is so far from where they live it is deemed inappropriate. This is particularly the case in rural communities, where girls finish their education after primary school. EFA raise monies to run boarding houses for girls from rural families, giving parents the confidence that their daughters will be cared for and hence education can be continued. 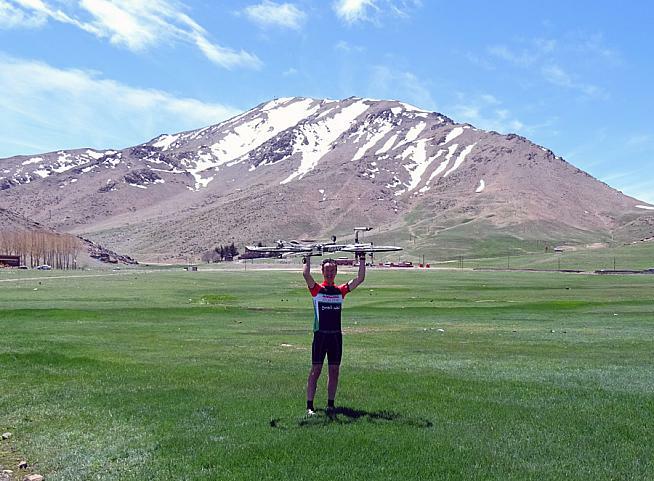 Mike came up with the idea of running a sportive from Marrakech to Oukamimeden with the proceeds going to EFA. He teamed up with Saif and Gareth, and the Marrakech Atlas Etape was born. At 8am on Sunday the 26th April the clock started ticking as we set off on our Moroccan adventure, watched by motorists that had been stopped by police to allow all of the riders safe passage onto the road to Oukaimeden. It was impossible to suppress a feeling of excitement as we cycled towards the snow capped mountains, being cheered on by people going about their daily routines. We comfortably spun up the gentle gradient of about 2% to the first food stop, one of four, which was comprehensively stacked with dried fruit, bananas, oranges, and bread and honey. 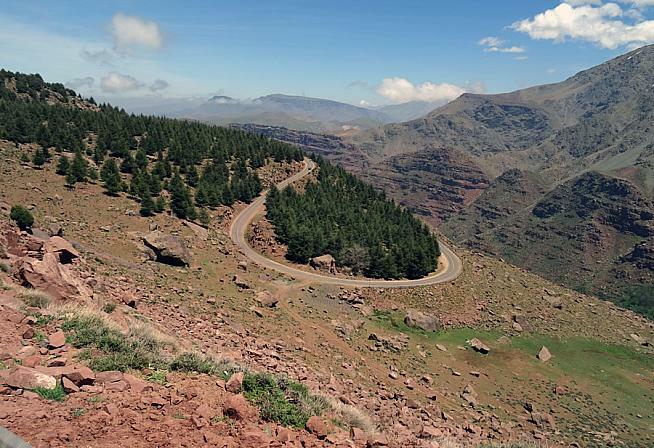 The route takes in scenes of rural Moroccan life. The stop is obviously strategically placed, as shortly afterrefuelling we started climbing. We passed through small towns until directed to turn right at a fork in the road. From here the work to overcome the increasing gradient began in earnest. 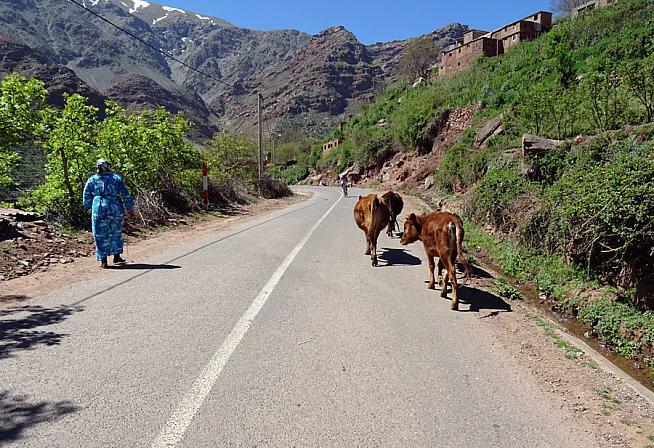 It wasn't long until we left the towns behind and entered the remote rural landscape typical of the Atlas Mountains. The views were glorious, and I for one had plenty of time to admire them as my pace dropped along with my gears. Up to this point we were cycling as a group, but as the gradient increased we splintered off and rode at our own pace. Pete and Leigh imitated climbers on the pro tours and disappeared into the distance, leaving David, Larry and myself to appreciate life in the slow lane. Through our sweat stained cycling glasses we experienced the real Morocco; in sleepy villages we came across women washing rugs in the roadside stream, a woman herding cows, and children playing in the road. Some of the children were excited to see us and ran alongside akin to Tour de France fanatics, shouting encouragement and holding out their hands for high fives. We climbed higher and higher, passing terraced fields as the views became more and more striking. The vista and landscape were just as awe inspiring, if not more so, than any found in the Alps or Pyrenees. As it turned out, our wives were experiencing Morocco too, although they were doing it in style; mostly by enjoying an excellent lunch at Kasbah bab Ourika located high on a neighbouring mountain. Our lunch was some way off, but our appetite was kept at bay by the food and water stops. After 4 hours 35 minutes the three of us reached the summit, and met up with Pete and Leigh who had conquered the mountain a few minutes earlier. A hearty hot lunch was provided by the MAE team which was soon devoured with gusto. It may not have been in a fabulous kasbah but it was a beautiful setting nonetheless, on a lush green meadow framed by snow capped peaks. Over lunch we chatted with fellow hill climbers and to Gareth Westacott. Gareth informed me how pleased he and the team are at the way the event is growing. "The word is spreading," he commented. "We have seen more entrants from across the world this year as well as more local cyclists wanting to ride it, including riders from the national team. In fact, even though it isn't a race, the best time has been broken this year by a Moroccan." Later it was confirmed there were over 200 entrants, of which 92 made it to the top. After our leisurely lunch we were waved off with a cautionary warning not to take risks on the way down. The descent was exhilarating, although not for the faint-hearted, especially on parts with no barriers on the side of the road. Care had to be taken on a small section that had been damaged by winter weather and also when passing through the small villages where children played. Otherwise it was virtually pedal free until we reached the lower slopes and the main road leading back into Ourika. 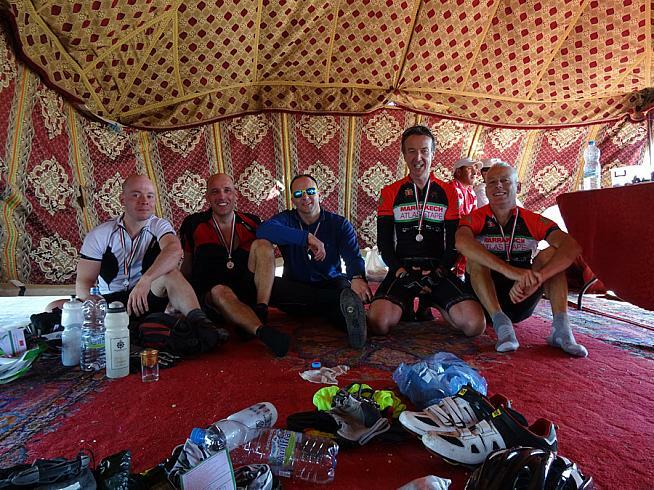 We proudly collected our well earned medals and finally kicked off our shoes under the shelter of an authentic Moroccan tent. The weekend was topped off by attending the optional charity evening dinner. It was a lovely occasion attended by the British ambassador for Morocco, who gave an after dinner speech applauding the work of all involved in the MAE and EFA. However, the star of the evening was a girl who gave a humbling speech about her experiences and where education has led her, all only made possible by the work of the EFA charity. Two girls who were also currently benefitting from EFA joined our table. Their language skills were remarkable and as well as informing us about the traditional food on offer, they each talked about their modest ambitions to become a teacher and a nurse. Opportunities that my own children take for granted. It was a great way to round off the weekend, to chat to fellow cyclists, to celebrate our cycling efforts and to hear first hand the work of the EFA and its inspiring achievements. If you are looking for a challenging sportive abroad, away from the masses on the well-known European classics, look no further. 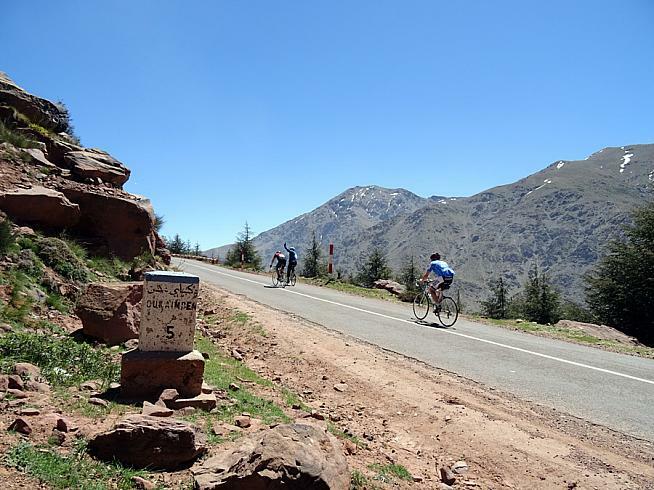 The Marrakech Atlas Etape has it all. Next year's MAE is on 24th April 2016. Registration is now open at www.marrakech-atlas-etape.com. Your riad or hotel will be able to help you to arrange transfers to and from the airport. Approximately £18. 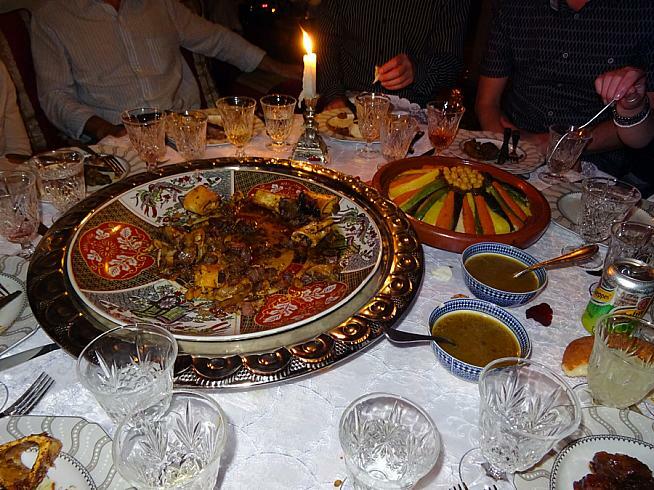 Official guides can be hired through your riad, hotel or the tourist office. Approximately £16 to £20 per half day.